Seventy years ago, a small city in West Kootenay turned into a raging river. Downtown, water lapped at the windows of the theatre's box office and the sight of canoes paddling down the streets was not unusual. 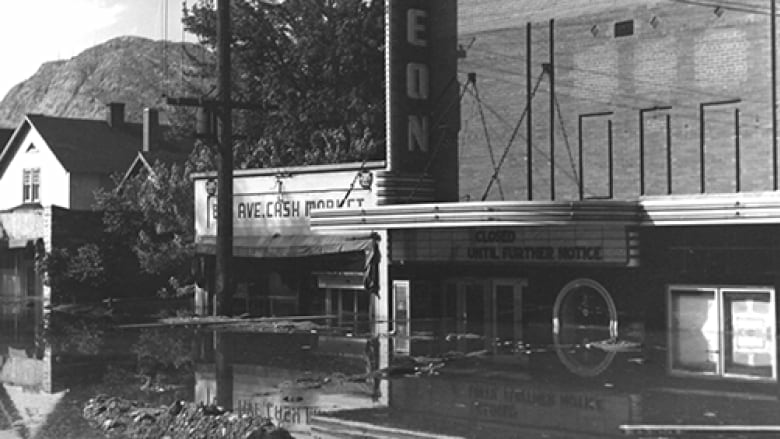 Seventy years ago, a small city in West Kootenay turned into a raging river. Downtown, water lapped at the windows of the movie theatre's box office, and the sight of canoes paddling down the streets was not unusual. Although the great flood of 1948 was more than a generation ago, it has not been forgotten in cities like Trail, which was ravaged by the high waters. At its peak, water from the river was more than 14 metres high. Houses were inundated and garages swept away. "It's still within recent memory," said Sarah Benson-Lord, manager of Trail Museum and Archives. "It's still in the back of our minds whether you lived it or not, you've certainly heard the stories." The museum is highlighting the history of the flood in recognition of its 70th anniversary with a new exhibit putting together archival photos and video about the devastating flood. The exhibit opens next week. "It was one of those events where everyone pulled out their camera," Benson-Lord told Josh Pagé, the guest host of CBC's Radio West. She said the archives were "chock full" of dramatic photos of the floods. At one point, the water was rising 60 centimetres per day and, in downtown Trail, water gushed past, more than a metre above the sidewalk. Thousands of people gathered to help fill sandbags and hand out meals. Some photos show small children standing atop huge walls of sandbags, actively involved in the volunteer efforts. "What [the flood] did was really reinforce the type of community that Trail is and always was — and that's one of generosity and dedication to one another to see each other through a crisis," she said. "I hope people really experience that when they see the exhibit." With files from CBC's Radio West.